The Yale Daily News reports that Yale University is blocking a popular course evaluation site called CourseTable (originally called Bluebook+) put together by undergraduate brothers Peter Xu and Harry Yu. This is the second time Yale has tried to stifle a student website rating Yale’s courses and professors. The first time it simply bought the site, Yale Bluebook. (Yale’s course catalog is commonly referred to as the Bluebook.) This time, Registrar Gabriel Olszewski demanded that the site be taken down because it was “making YC course evaluation available to many who are not authorized to view this information,” and the site used the word “Yale,” the school’s logo, and the term “Bluebook” without authorization. 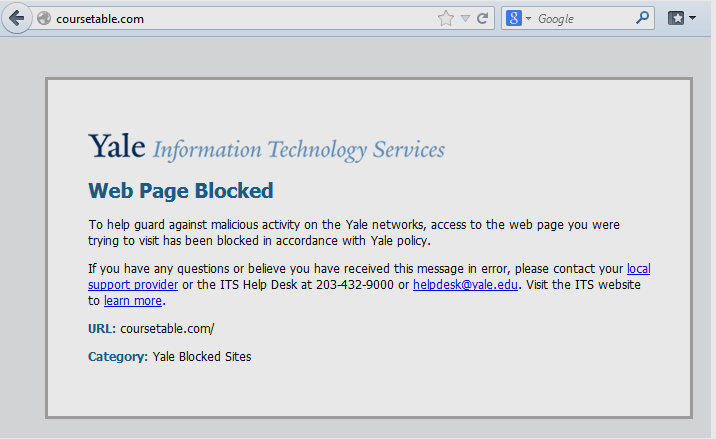 When Xu and Yu did not cave to the university’s demands, Yale opted to block the site on its networks instead. The authors have now posted The Great Firewall of Yale, an online petition that urges Yale to respect free expression and allow access to CourseTable. Above all, every member of the university has an obligation to permit free expression in the university. No member has a right to prevent such expression. Every official of the university, moreover, has a special obligation to foster free expression and to ensure that is is not obstructed.